Victor of a previous B Grade Colin Morris found the step up to the A tough, partly because he was playing in one of the toughest A grade groups we have had in the UK-Racketball Series containing, top racketball junior Ollie Turner, Paul Norton (new to racketball but a superb striker of the squash ball), Craig Chappell who is climbing the rankings amazingly quickly and racketball legend Dom Hamilton. Turner was too mobile for Morris but Turner couldn’t live with the pace of Chappell who struggled with the accuracy of Norton. Hamilton was brilliant but got off to a slow start being pushed hard in his first match by Turner. There was just too much going on for Phipps in his first match of the day with so many fast angles and changes of pace, Michael Tolman played fantastically well despite a valiant last stand from the 2011 Series Champion ran out a comfortable 2-0 winner. Rich Davis was as solid as always making very few mistakes and staying strong. Both Phipps and Tolman had pace and age on their side but found it impossible to make it through the Davis defence. New to the Series Ian Chappell made an impression in all his matches, he hits it well is fast and attacking, he will be one to watch in the future. The first was tight with Davis leading right till the end. Hamilton as he so often does stayed patient and then found his winners right at the end. The second went Davis's way. Hamilton seemed to have lost concentration and tried for too many winners off balls that were not quite right, Davis stayed strong kept it tight and fed off Hamilton’s pace, a comfortable game for Davis and the match was going right down to a decider. At the start of the 3rd Hamilton regained his patience and his length which began to open up the court for his pace and attack. After a tough start he pulled away and by the end (after a full length dive from Hamilton) Davis must have been wondering how he could get a point. In the end the game looked comfortable for the racketball legend in front of his home crowd but a couple of points the other way at the end of the first could have made for a very different story. Hamilton now has 7 titles to his name and an unbeaten run of 28 matches which is a phenomenal record in any sport. Janak Malkani made it through against higher ranked Graeme Slocombe but was taken to a deciding game by Michael Connell. "He hits it so hard when I saw him knock up I thought I had a chance but the pace when you get on was too high, in the end I was well beaten". Slocombe on his Malkani match. Peter Curwen put up a tremendous fight against Michael English and forced a 3rd set but English finished strong, "He's 15 years my junior" Curwen was heard to say. Gabriel Uttley maintained his UK-Racketball run of form beating Nigel Stallworthy 2-0 to make it through the smallest group of the day. Neil Widdowson played well in his opening two matches before picking up an injury to his back forcing him to retire. It was Stephen Uttley who capitalised on his misfortune. Top seed Graham Greensall came through without dropping a game. It was tough for everyone in the 6th group of the Over 50’s with ex National age group champion David Manning defeating Jez Horrocks before being beaten by Paul Haigh who celebrated his birthday and moving into the Over 50’s with a straight set victory in the group stage. One of the tightest groups in the over 50’s with Peter Fielding narrowly missing out to Prem Sispal. Chapel A’s head coach Peter Edwards dispatched Phillip Hopps comfortably before being pushed all the way by Series favourite Jack Gilchrist. "Both games were tight, I just ran out of energy towards the end of the games, he kept steady and I hit the tin, good match though"
"It was tight all the way, in the second he was 9-8 and went for a skid boast that didn't work. From then on I was on top and made it through"
In the first Semi final Janak Malkani had too much for Series favourite Gabriel Uttley and in the other half local hero and head club coach Peter Edwards fell to the pace and accuracy of Paul Haigh. It was 5 games into the day for both competitors and it was always going to be the survival of the fittest. On this occasion Paul Haigh came out the victor. Jo Moseley continued where she left of it Devon at the end of last month and stayed strong to take the top group without dropping a game. 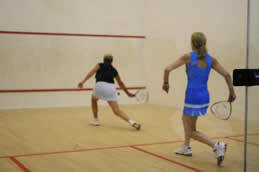 Sylvia Blaney came close against Jayne Dixon losing the first game narrowly 12-10. Ella Dewhirst pulled of a surprise victory, defeating Jayne Dixon 2-1. Emma Stallworthy came close in all her group matches including narrowly losing to Sam Whiting 14-12 in the decider. Patricia McKinney was her usual accurate self coming through to take the group without dropping a set. It was a close match between Juliana Caines and Alison Graham but Graham was to strong in the end. The first semi final was a great match between Moseley and Morris with Moseley’s hard hitting and compact style seeing her through. The second semi final was also close but British Junior Champion Parslow came through victorious against McKinney. 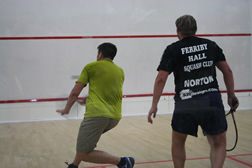 It was McKinney’s first ever UK-Racketball event so a fantastic effort to make the semi finals. The women’s final was the last match to go on in the day and was between the tournament’s top two seeds, England no. 7 Jo Moseley and England no.9 Matilda Parslow. Moseley scrapped hard getting balls back and putting pace on the ball to make it difficult for her younger opponent. Parslow has progressed well over the last couple of years though, she moves better and is more accurate with her short game and in front of her home crowd she was determined not to be denied and came through 2-0 to claim another UK-Racketball Title to add to her collection. Jason Russell took his first over 40’s title at the end of last month when he overcame Rob Watkins in Devon and ended his unbeaten run of 28 straight UK-Racketball Series victories. He carried on where he left off and dominated both Mark Francis and Joe McKernon in the opening matches of group A.
Andy Flynn managed to overcome Stephen Eyles in a tight match but neither were a match for England no.3 Mark Webster who was on a quest for his first title. "I played Simon in the first game, he had bundles of energy and was looking very fit but I made it through 2-0. Darren had some great shots in the next one but I managed to take his legs. Just have to make sure i get through one more and then it will be a Neil Baldwin in the semi's"
Neil Baldwin made it past the dogged resistance of Gary Turner and Paul Whitby to set up a semi against Lord. The first game was close but Russell dug in deep and picked up a lot managing to sneak it right at the death. Despite Webster controlling the second Russell again dug in at the start of the 3rd, using his fitness and strength to negate Webster's shots. It was tight all the way with the clash of styles making it a fantastic match to watch, Webster was moving the ball around well but Russell’s counter drop is lethal which made it hard for Webster to move him to the front as much as he would have liked but in the end the battle was won by Webster with a couple of superb boasts to end Russell’s defence, best match of the day so far! The final was a bit of a letdown after the fireworks of the semi final. David Lord controls the ball well and his shots were just too much for the already tired Webster, he fought right to the end but you could always sense there was only going to be one winner, first UK-Racketball title for a Lord! Another good turnout in the beginners draw with loads of the Hallamshire faithful taking on the club locals but in the end it was from the far off Le-on-Solent who came through champion. Martin Elliott was unlucky to only come away with 2 points after taking both Bryn Roberts and Edward Smith to a deciding game. 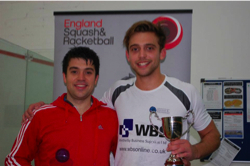 Both Oliver Davidson and Edward Smith came close to taking the title from Abrahams grasp but his ex squash experience shone though taking him to his first title. It was a tough match between Lee Brownson and James Tomlinson. Tomlinson retrieved well and kept it tight under pressure making life hard for Brownson but in the end he moved the ball around to much and made it through to his 2nd Semi final of the series. It was a tough opener. With Louis McLeod against Dariusz Wanatowski, and both players giving it all as always, Lewis came out on top on this occasion with too many mistakes from Dariusz. Andy Wood came through the group with six points, playing really well but was pushed all the by by Kasey Hall. Andy Wood only made it through the group by one point. Dariusz’s slow start improved as the day went on, chasing Andy Wood and Kasey all the way. It was close between Lee Walton and Peter Widdowson but the clear winner was Nick Bond who came through with four points. Series favourite David Herron made it through very comfortably to take him to the semi finals. There was upset in the first semi with Andy Wood coming out on top against Lee Brownson. Both players were right at the top level of the B grade and play a good game, but on this occasion Andy Wood prevailed. David Herron fought really close all the way against Nick Bond and managed to just sneak it. Unfortunately for Herron he went straight on to the Final after a tough semi. Andy Wood got off to a good start, and raced to 1-0 up. Herron fought back hard as he always does, demonstrating his athleticism and flexibility to claim the match and his first ever B Grade final at the 12th time of asking. Chapel A is one of the best racketball clubs in the country with this event being one that many of the players look forward to all year round and it didn’t disappoint. It was another great day for the UK-Racketball Series with some fantastic moments played out across the 162 matches. Nottingham is next and if it is anything like last year it will be one of the biggest and best racketball tournaments in the country! It’s a fantastic turn out once again with over 80 competitors across the 6 grades. Top seed in the women’s, Jo Mosley will face some tough local opposition from one of the biggest women’s draws in the UK-Racketball Series so far in 2012. In the Over 40’s top seeds Jason Russel (the victor in Devon last month) and Mark Webster are both ranked 3 in England but will have to fight through a score of local talent to make it to a much anticipated final. Dom Hamilton is back in the Men’s A. The only player since 2010 to remain unbeaten in a UK-Racketball Event but how will he fair against last year’s Series Champion Tom Phipps. In July, UK-Racketball returns to Chapel A, building on the success of the UK-Racketball tournament in 2011. Situated in leafy suburban Leeds, the Chapel A Tennis, Squash and Gym Club promises to be perfect venue for our UK-Racketball event. The club first purchased a wooden squash court in 1960 and due to the popularity of the sport, changed their name from Chapel A Lawn Tennis Club to Chapel A Lawn Tennis and Squash Club. However, in recent year Chapel A has become a hotspot of Racketball talent and one of the leading Racketbal clubs in the country. The club runs many events andleagues throughout the year and is also home to the annual North East racketball championship. Members, Dominic Hamilton and Paula Arrowsmith, competed in the National Racketball Championships, with Dominic in 2011 Racketball End no 1 spot for the first time. Get your entries in early to avoid missing out on this fantastic racketball event. Entry to the whole Harrow UK-Racketball Series is just £50 providing you with some of the best value tournaments in the country at just £6.25 per tournament!!!! Beginner – This is for players who have recently started racketball. Players who have previously played squash to a high level and have now started playing racketball may be better off in the A or B grade. To maintain a fun atmosphere for this grade only trophies will be awarded to the winners however there will also be a reduced entry fee of just £10. Women’s – We would really like to keep expanding this category for 2012 with the aim of getting enough numbers to be able to split it into two grades. The grade is for any standard or age of player. If you are unsure which category to enter please feel free to contact us at info@uk-racketball.com and we will be happy to advise you. If entries to a category are not sufficient grades may be merged, however all participants will always be informed in advance and they will have a choice if they would still like to play. The tournament will be run over 1 day. All draws and start times will be published on this page the week of the event. All entries will receive a Harrow 2012 UK-Racketball Series t-shirt. We ensure every competitor will have at least 3 matches. The format will be either group stages through to knockout, monrad or straight knockout, depending on numbers of entries. We will always ensure that every competitor has at least three, best of three, matches. Scoring will be American to 11 and best of 3 games. 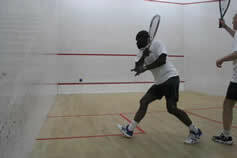 The tournament is sanctioned by England Squash and Racketball and has a grade 1.5 status. Top of the range prizes from the Harrow racketball range – The UK-Racketball Series will have the same main title sponsor as last year, Harrow who will again be supplying top rackets from their range of quality rackets, check out the UK-Racketball Racket Shop for reviews on what you could win! Gain top ranking points for the UK National Racketball Rankinga. Earn points towards your UK-Racketball Series Rankings (see how they work here). All balls used will be as specified by England Squash and Racketball, unless stated otherwise. Club facilities include; Six squash courts, three of them glass backed, a great gym, bar and bistro area and an onsite shop.